Three books in one. A wonderful way to get to know the remarkable Sylvia Browne, (She's on my list of people I'd most love to meet.) The other two titles in this "anthology" are, Adventures of a Psychic and If You Could See What I See — a bargain! It's a fascinating, eye-opening, and thought-provoking journey reading Sylvia Browne's books, not to mention educational. Her life as a psychic is not remarkable as such, but what she sees and knows and hears, is remarkable, and for some, hard to accept. But, with an open mind and heart, one has to consider everything and anything as being possible. Sylvia's story this time around (172 pages) is about her beloved Grandma Ada, who comforted and guided a very young Sylvia at the outset of discovering her gift. As her mentor, and being spiritually advanced as well, her love of humanity and helping others, Grandma Ada was to Sylvia a spiritual guide we all should have growing up. Both Sylvia and her grandmother know their spirit guides, and we get to know what it's like (frightening to start with I'd imagine!) hearing words of wisdom or explanations or warnings from them. I find this whole psychic ability extremely fascinating and elucidating, and I never discount anything (fairies, aliens, predictions, "voices") because ultimately, we (the rest of humanity) don't know for sure. And how can we discount anything we can't prove? There is always a possibility. Ditto when it comes to religions. Sylvia Browne's books almost always manage to bring tears to my eyes and move me sometimes to the point of getting chills. Her words are comforting, enlightening, and for me, words to live by. She shares her precious letters from her grandmother with us, validating her granddaughter and expressing her love and encouragement. What a gift! Questions for Sylvia: If we all plot our lives before we get here, and for example "choose" to be ill in this life, what good does praying do for the sick person if that's what they "chose"? Apparently we can't just up and change our plot line (if we can, please tell me how), so why keep praying for change when it's not likely to happen? That thought just occured when reading this book and I thought I'd ask Sylvia in this review. If we chose a life of poverty, what good will praying for riches do? If our prayers are "answered", isn't it because that's what we charted for ourselves? And the "unanswered" prayers, wishes, and desires are because we did not plot them into our lives? 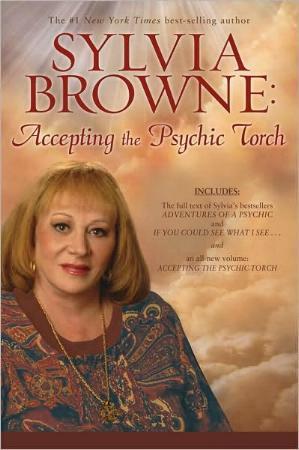 Conclusion - If you're new to Sylvia Browne, this book is the perfect place to start. As usual, I had my fair share of chills (recognition) and shed a few tears. Always very stirring words.